The Digitax ST has a compact design to meet modern manufacturing needs and sacrifices nothing. The Digitax ST is available in 4 designs to match your specific servo requirements, all with an unmatched range of flexible integration features. Model applications range from simple positioning to precision synchronization and networking. 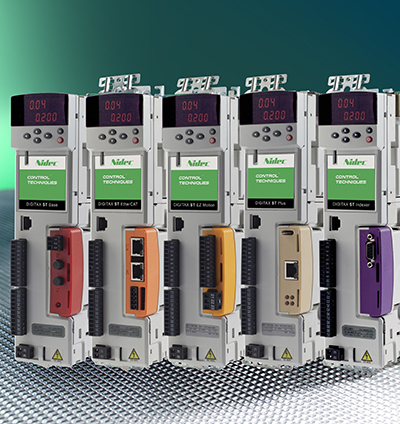 Drives are available in 230 VAC to 460 VAC input voltage, single or three phase, and are DIN rail mountable. The Digitax ST can quickly be configured using a removable keypad (optional). The SmartCard is supplied with every drive and enables parameters to be saved and copied from one drive to another. Each drive accommodates click-in, SM Option Modules to customize your communication, I/O, feedback, and Co-processing needs. Additional options include: brake relays, internal braking resistors, EMC filters, breakout boards, encoders, and all cables needed to put your designs in motion. This smart, compact, ergonomically designed drive, is your ticket to "Motion Made Easy". SM-ENCODER-PLUS Encoder Plus Solutions Module, provides an additional incremental encoder feedback port. SM-UNI-ENCODER Universal Encoder Plus Solutions Module, provides an additional increamental or Absolute encoder feedback port and simulated encoder output.